Our high-quality food machines can be configured to vend a wide variety of products. From fresh fruit and yogurt, to larger snacks and plated meals, we can deliver a machine that meets your needs. It is often necessary for hospitals, educational establishments and certain businesses to offer catering round the clock. However, it is not always economically feasible to run a canteen through the night, and some premises are not large enough to accommodate full kitchens. In such cases, food vending machines provide an ideal solution. They ensure that everyone, whether they’re tired employees on the nightshift, or tenacious students who choose to work through the night, they can have convenient access to nutritious and wholesome meals at all times. Though there are only two models in our range of food vending machines, we can cumstomise each and offer with a huge range of products and configurations. You might wish to offer an irresistible selection of sweet treats to boost morale, or perhaps you would prefer to promote a healthy lifestyle by offering a range of nutritious food. In any case, we are able to deliver a machine that has been tailored to your specific needs as a business. 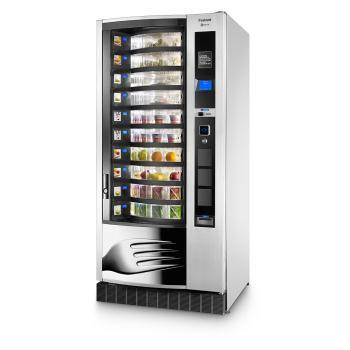 Both of the food vending machines in our range are glass fronted models. They have a striking visual impact that is specifically designed to attract consumers and encourage impulse buys. This means that they have such a huge sales impact that they can even act as an additional source of revenue. Our food vending machines are highly efficient, with carbon neutral options available on some models. Indeed, with its A+ EVA EMP rating, the Necta Festival can perhaps lay a claim to being the most efficient food vending machine on the market. Other customisation options include cashless systems, healthy vending options, inbuilt order systems, and branding options. If you have any questions concerning our range of food vending machines, or if you would like a quote for your business, call us on 028 90 826 562 (NI) or 1890 321 000 (ROI). Alternatively, you can email sales@rationvending.com. 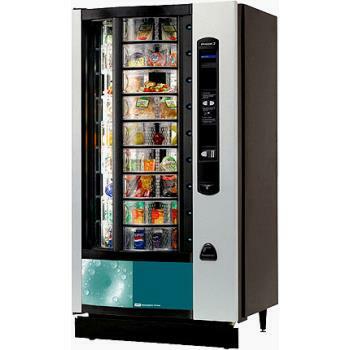 The Shopper 2® vending equipment has been designed to meet the varying needs of a 24 hour refreshment vending service. These vending machines provide the largest selection of products that modern consumers demand including healthy options, leading to higher sales volumes and increased operator profitability. The Shopper 2 is the first choice for around the clock fresh food, snacks and cold drinks vending. Necta's food vendor is a smart vending solution for locations requiring a catering service 24/7. The Festival is a true automatic canteen offering flexibility on drum configurations, catering to a range of products from snack,drinks, fresh dishes, fruit and yogurt. It is the most energy efficient food vendor in the market with an EVA EMP rating of A+.